Fossil Rim’s Natural Resources Department was happy to host Tarleton State University’s Biological Honor Society, TriBeta, for a college conservation day camp in early December. Tarleton State is located in Stephenville, 30 miles west of Fossil Rim. Vanessa Hays (left) and Caitlin Pyle (right) of the Fossil Rim Nature Resources Department were excited to host Tarleton State University’s Biological Honor Society, TriBeta. Hays and Pyle both graduated from Tarleton. 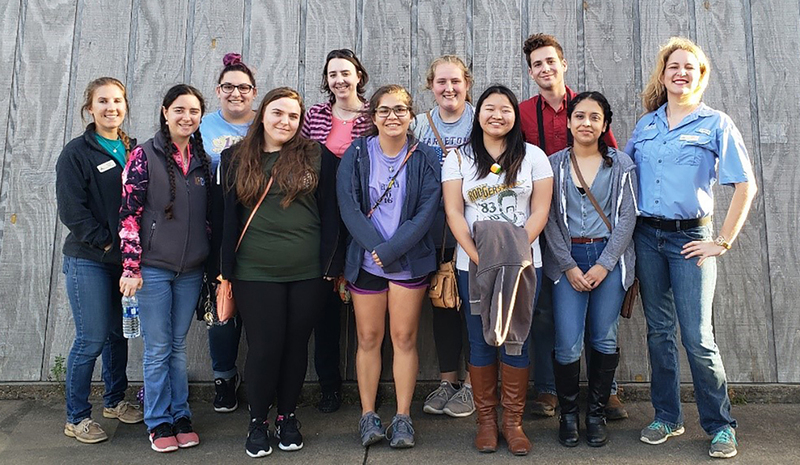 A group of six undergraduates in varying biological disciplines were joined by a biology graduate assistant, as well as the adviser for TriBeta and assistant professor in the university’s biological sciences department, Dr. Victoria Chraibi, for an afternoon at Fossil Rim. TriBeta undergrads experience a giraffe snake attack, albeit a gentle one. Fossil Rim Natural Resources Manager Caitlin Pyle and Natural Resources Management Specialist Vanessa Hays both obtained B.S. degrees in biology and M.S. degrees from Tarleton State University, plus Dr. Chraibi was one of Hays’ committee advisers during her thesis defense. 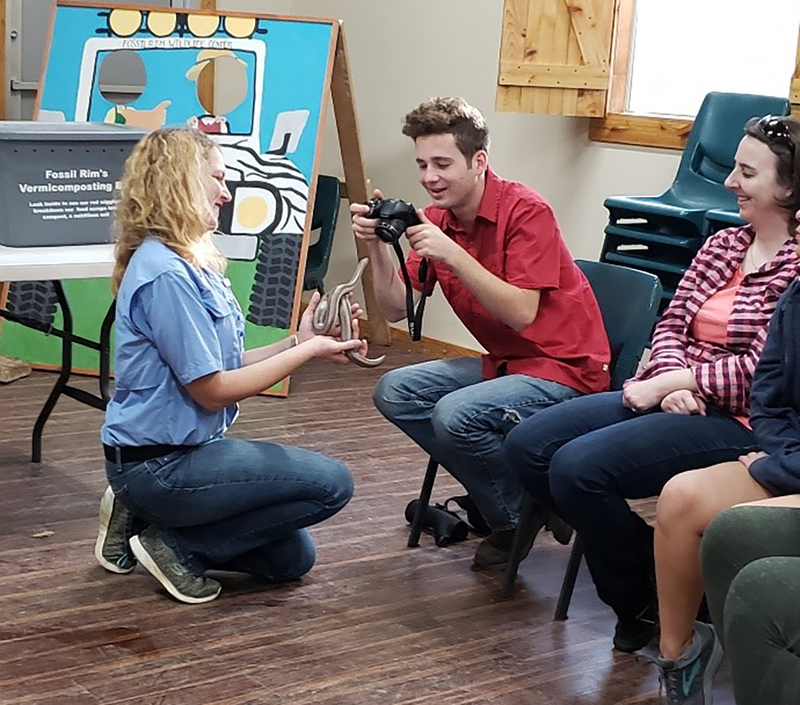 When Dr. Chraibi first approached Hays, she was looking for a fresh educational field trip and was excited to discover what great opportunities were open to college-aged students at Fossil Rim. The students started their visit with a fellowship lunch at the Overlook Café, getting the opportunity to speak with the natural resources department about future careers in their field, what a day in the life of a Fossil Rim staffer is like, plus volunteer and internship opportunities. 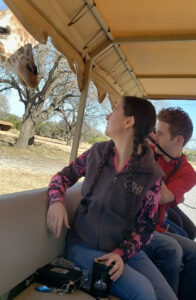 As Pyle gave a guided safari tour targeted at their educational interests, the undergraduates were able to meet all of Fossil Rim’s crowd favorites and conservation success stories, such as the giraffes, white rhinos, cheetahs, and many endangered or threatened antelope species. Natural Resources Management Specialist Vanessa Hays exuberantly explains the process of compost windrow creation to the TriBeta group. They ventured over to the waste conversion facility and received a tour of the compost area from Hays. “It was a wonderful feeling being able to share what I do at Fossil Rim with students from my alma mater and Dr. Chraibi,” Hays said. Tarleton State students get hands-on with an African giant millipede. Natural Resources Manager Caitlin Pyle provides a closer look at a rosy boa. Children’s Animal Center Supervisor Kristina Borgstrom explains the differences between tortoises and turtles with the help of a Texas tortoise and an eastern box turtle. 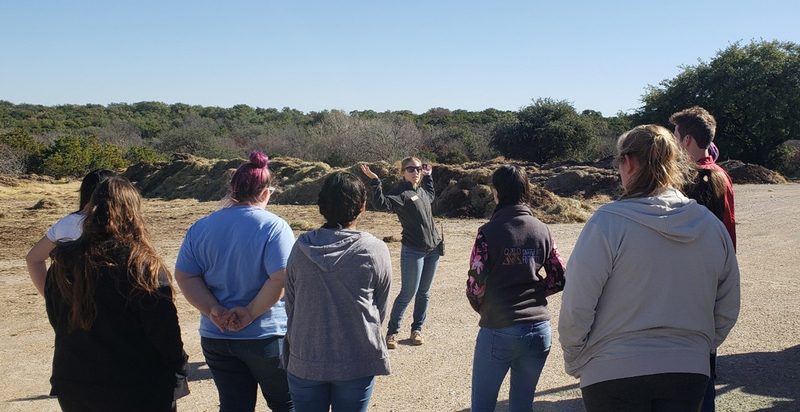 The tour ended at the EcoCenter to meet Fossil Rim’s diverse collection of ambassador animals with Children’s Animal Center Supervisor Kristina Borgstrom, as she provided in-depth knowledge about each animal’s habitat and ecology. 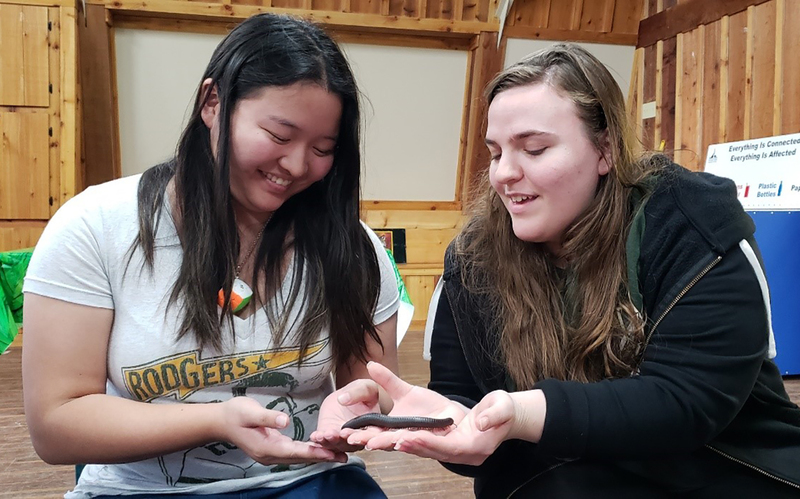 While some students shied away from the Madagascar hissing cockroaches, others could not wait to interact with the African giant millipedes and the rosy boa. The students of TriBeta could not stop talking about their experience at Fossil Rim and their tour with the natural resources department. Pyle and Hays heard from Dr. Chraibi a few days later that, during the TriBeta awards banquet, the students continued to discuss the fantastic time they had at Fossil Rim and that they were excited for any volunteer opportunities which might arise for them in the future.